This November, we were abundantly blessed with the “10-Gallon Milk Challenge”. This challenge supports the dairy industry, farmers, and helps the local non-profit that is receiving the donation. This month the challenge was accepted by Doris Lewis representing Kentucky Fried Chicken, Dale Hevey representing Performance NAPA, Terri and Jeff Hawkins representing Stitch Works, Macey Deaton & Adriana Hernandez representing Reliant Fire and Security, Steven Courson representing at Belle Glade Wholesale, Bryan Royal & Terrell Squire representing Royal’s Furniture, and the Glades Central High School FFA along with the Gove Elementary – Gove Fuel Up Play 60 Program. We are so grateful for the generosity and support from these organizations and their representatives. 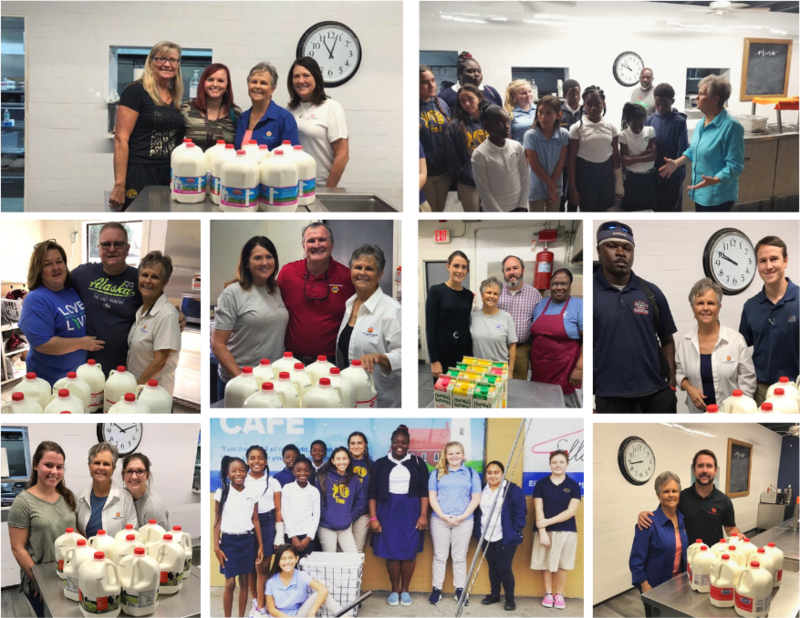 To further the mission surrounding this initiative, the USDA purchased $51 million worth of milk from the dairy industry and donated it to food banks across the country to be distributed to non-profits! Likewise, locally, another incredible challenge has initiated, “The Give Fresh Challenge”. This challenge is focused on supporting Florida grown products and the local non-profit receiving the donation. We are so blessed to have already received donations of fresh produce such as corn, green beans, cabbage, lettuce, and more that was grown in the Glades area. If you would like to take part in this initiative, we encourage you to donate your choice of Florida grown/produced food items such as oranges, tangerines, grapefruits, orange juice, etc. to The Light House Café. November was also filled with additional events and excitement! On the 1st of the month, I attended the “Quantum in the Community Celebration” where we received a grant for the Light House Café! This is the fifth year that we have received a grant from the Quantum Foundation, and we thank the Grant Committee, Shannon Hawkins and her staff, for their continued support. In addition, #GivingTuesday on November 27th was a huge success! The goal was to raise $500 for the Light House Cafe and Ella’s Closet; however, the goal was surpassed and a total of $860 was donated! We are so appreciative of everyone who donated to this fundraiser! Thanksgiving arrived quickly! In preparation, we planned our menu, shopped for the items we needed, and prepared our Cornbread Dressing. We had promises of turkeys to be donated, but unfortunately, they did not arrive in time for us to safely thaw and cook them for our Thanksgiving Dinner on November 20th. The Hill Foundation saved the day with a generous donation of smoked hams switching up the menu to: Smoke Ham, Cornbread Dressing, Collard Greens, Sweet Potatoes, Gravy, Rolls, and Peach Cobbler or Cherry Cobbler for dessert! We served 200 patrons and it was indeed a delicious feast! Plus, we now have plenty of turkeys for our Christmas dinner on December 21st! During our Christmas event, we will also be giving out our annual “Hygiene Gift Bags” to each patron. Thank you to everyone who has already donated items for this project. A special thank you to the Good Shepard School in Pahokee, FL as they committed to performing a “random act of kindness” by donating socks for the bags! If you would like to contribute to this project, we are requesting the following items: (new, unopened) shampoo, toothbrushes, toothpaste, deodorant (male and female), soap, disposable razors, shaving cream, body lotion, wide tooth combs, washcloths, and bath towels. Donations need to be to us by December 14th so that we can prepare the bags for distribution on December 21st. If you need us to pick up items you have collected, please call me at 561-993-7020. Collectively in November, we served 946 breakfasts, 1,439 lunches, delivered 951 “sick-and-shut-in” meals, and made 1,091 snacks for the children of the Life Center. We are so thankful for the support that we receive from the community, the Glades Family is really the best. As we move into the Christmas season, we are so grateful to celebrate the birth of our Lord and Savior Jesus. As always, we ask that you continue to pray for the volunteers and staff of the Light House Café, as well as all of those that we see every day who are afflicted by drugs, alcohol, mental illness, and poverty.